There is a kind of rug called an engsi, whose role in Herat is to serve as a doorway: to separate inside and outside. In Afghanistan the engsi is called a purdah. Purdah is also the term used to describe the cultural practice of separating and hiding women, through clothing and architecture – veils, screens and walls – from the public gaze. In purdah, women wear chadors or veils to cover their bodies from head to foot. The traditional Afghan version is called a burqa. Under the Taliban women had to stay inside and when in public wear full burqa. Only their eyes could be seen, the rims sometimes coloured with black kohl, looking out through the window of an embroidered screen. 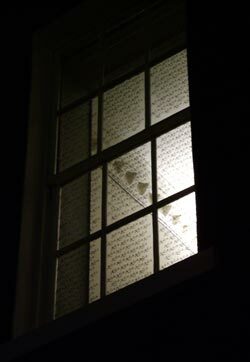 ‘An Embellishment: Purdah’ was written in black kohl on the twelve panes of glass of a window on a landing facing to the west. Depending on where (and when) you are, in the gallery or in the street, the work can be read like a script and seen like an image. Transparent yet opaque, concealing yet revealing, this embellishment, as a form of decorative covering, invites you to imagine beyond the places you can see. ‘An Embellishment: Purdah’ was exhibited for ‘Spatial Imagination’, (The Domo Baal Gallery, London, January 2006) with an associated catalogue essay in Peg Rawes and Jane Rendell (eds), Spatial Imagination, (London, 2005).